Hi everybody, we are Nicole and Scott. Pictured with us are our Labs Cooper and Ripley and they are tail wagging excited that we have become the proud owners of River Run Pet Sitters. Just like us, we know your pets are important members of your family. That’s why we are so happy to provide the necessary daily needs such as walks, exercise, attention, and love that your pets require when you can’t be with them every hour of the day. Along with our dogs we also have 3 horses that we board out in Allentown. We personally know the importance of having the comfort and convenience in someone other than the two of us who can provide the quality care our horses require each and every day. This is the same assurance that River Run Pet Sitters can provide for you and your pets. All of our employees are pet owners themselves. So you can be assured that we all love animals. 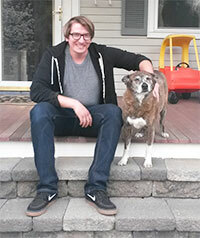 We look forward to meeting you and your furry family members in the near future when you need our services. I am pictured here with Jed, my 8 year old beloved (and energetic) Belgian Malinois. I look forward to meeting you and your pet(s) and I will give the absolute care that I give my own! I also help manage our River Run office! Hey everyone, my name is Mark. I am pictured here with rescued pit bull mix, Bella; a cat inherited from my mother-in-law, Fatboy (lower left); and from my sister, I inherited Sarcia. These, plus a colony of 5 feral cats and 1 somewhat tame wife make up my family. I love River Run Pet Sitters and have been here over 3 years. 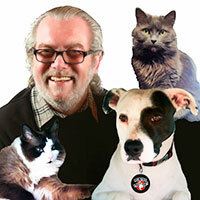 For some reason dogs and cats love me….maybe it’s the beard? I find that dogs especially like my sense of humor…cats, not so much. You can trust me. I will love your 4-legged friends as if they were my own, and you won’t have to worry while you are away. Mac and Lucy aren’t as excited as I am to be joining the team at River Run Pet Sitters, but they are willing to share their mommy so that your furry loved one will be in loving and patient hands. 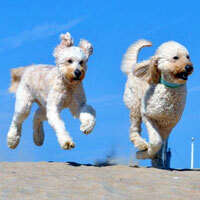 My Goldendoodles can vouch for me, I am an animal lover through and through. These furry goofballs are so much more than just my pets—they are cherished members of our family! Having been a dog mom for over 30 years, I have tons of experience with pups of all ages, sizes, and temperaments. I will take care of your pets just as I do my own and look forward to doing so! Hi! My name is Pam. It’s great to meet you. I adore animals of all types: from the furriest family members, to the scaly pals and from the most docile, to having limitless energy. My own family of loving ladies and gents includes three cats (Oni, Doom, and Steven Tyler – Ages 9-12), a Yorkshire terrier (Kirby! ), and two rats (Jules and Vince) – all of whom have such dynamic personalities and adore the consistent affection and playtime they get. I can’t wait to share the same care I give my little ones with yours! Hi everyone! 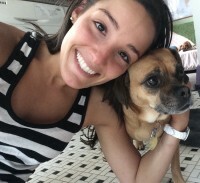 My name is Lauren and I have been an animal lover my entire life! When I was finally at a time in my life where I could give a dog all the love and care it requires, I adopted my best friend, Penny Lane (pictured here). I love and adore her as if I gave birth to her myself :). My fiancé and I have since added to our crew with two fish, two rescue cats, Miles and Kato, and a dog, Basil, Penny’s partner in crime. I look forward to meeting and caring for new furry friends in the neighborhood! I am a dog fanatic and an animal enthusiast. I have experience tending to and watching dogs of all sizes and tempremants. From apple headed Chihuahuas to Great Dane mixes, I get along with them all. I am also a huge fan of cats and find them deeply mysterious. I spend an ample amount of time watching and rolling in hysterics to the great cat and dog videos of the Internet. Animals enrich your’s and my lives. I am extremely happy to be apart of an organization that helps provide extra care for your fellow fur balls. Hello, my name is Karen. I currently have two terrific cats, Maggie (pictured chilling with me) and Hailey (who was camera shy), both adoptions from the humane society. Over the years, I have shared my home with many other animals, all of whom were treated as part of the family—because they are! I am a lifelong animal lover, especially cats and dogs, and was a dog n cat sitter/walker for family and friends in my spare time before coming to River Run after I retired. As someone who always had animals, I understand that having someone help look after them, when you cannot, can make their day brighter and more interesting and can give you piece of mind when you can’t be home! 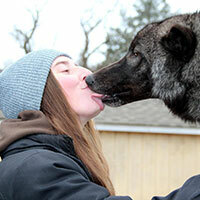 Working here is awesome, I love meeting new animals and their people, and building relationships with them. This job is a dream come true for me! 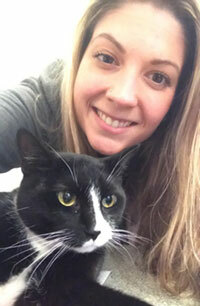 My name is Jacqui and I am the proud mom of my fur-baby, Layla! I rescued her in February 2016 at the MCSPCA as a shy, fearful pup and now she’s an absolute social butterfly! I also care for two other pups who live with us, Boken and Bella. It’s crazy living with three puppies, but I wouldn’t have it any other way! I’ve been an animal lover my whole life and have taken care of everything from fins to feathers, hooves to hamsters, and wobbly kittens to wolf-hybrids. I look forward to meeting you and your fur babies and providing the same love and care you give them! Hi! 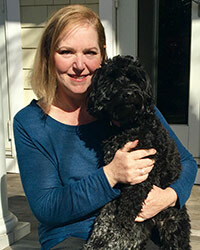 My name is Nancy and pictured with me is my dog Kasey. Recently, I moved to the area with my husband and four daughters. I have always had at least one dog and really love taking care of your pets as though they were my own “furry children”. Getting outside and exploring the area neighborhoods has been a fun perk of this job for me. Snuggling lots of adorable pets is a good one too! Hey everyone! My name is Caitlin. I have lived with and cared for animals my entire life. My family and I cared for our last two dogs until they both passed away about 5 years ago. My family and I now have rescued and care for 6 cats. I have an immense love and respect for animals of all kinds. I also had the opportunity to intern at 6 flags great adventure and learn animal training techniques. I’ve house sat numerous times with older dogs with disabilities (blind, low physical movement, low appetite), and rescue dogs with high anxiety and trust issues. I have been trusted by many of my friends and clients with permanent keys to their homes, in the event that they need me unexpectedly to feed or walk their animal. I love taking long walks through parks, the woods, and on the beach with my furry friends. I do work full-time and I am a full-time graduate student. However, I still have a bunch of free time in my schedule and am very willing to work with yours! I’ve had wonderful pets all my life and find them to be a total honest loving joy to be around. Pets do not ask for much but give back so so much in return. I retired a year ago and spend five days a week volunteering at the Monmouth County SPCA helping with dogs, cats, puppies, kittens and even birds in anyway that I can. Very fulfilling and the best job in the world. I look forward to caring for your pets as I currently do for my awesome shelter buddies and as I have cared for my own in the past. Nice too meet you! My name is Courtney and pictured with me is my best friend Jack! Jack accompanies my fiance and myself on all of our outdoor activities such as camping and hiking or just exploring the world! I’ve always been an animal enthusiast since I was a child. 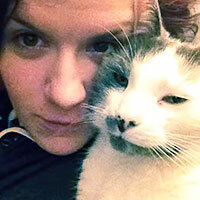 From rescuing stray kittens or caring for baby birds too loving my furry family member Jack! Too me, anytime spent with a pet is time well spent. I look forward to meeting you and your furry family members in the near future. I will always greet them with the warmest of smiles and kindest heart because I know just how loved they truly are. Hello, my name is Jamie and pictured with me is my best friend, Lakota. We do everything together! 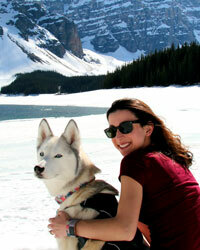 Lakota is a Siberian Husky who has traveled across North America with me. Any chance to be in the mountains, Lakota and I will be out there hiking and exploring. 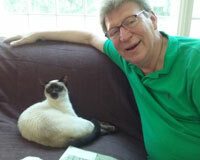 I understand the profound bond pets can have with us and I look forward to caring for your pets as I would my own. Hi everyone! My name is Danielle. 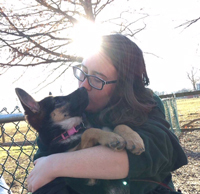 I am pictured with Nikita, she is a German Shepherd I am raising for The Seeing Eye to one day be a guide dog. I also have a pet Siberian Husky at home, along with some Koi fish in an outdoor pond. I’ve had a variety of pets throughout my life, including dogs, rodents, and reptiles, and I lived with cats for a time. I love animals so much I got a degree in Animal Science from Rutgers. I can’t wait to walk, play, and care for your animals just like they are my own. Hi, my name is Katie! 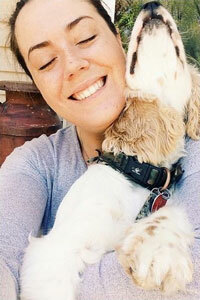 I have been working with dogs for the past 7 years and have experience with every type of breed and all temperaments. I love all animals and am a proud dog mom of 3! 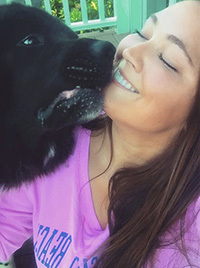 I have experience in dog grooming, dog training, and dog behavior.My favorite thing about this job is the bond and friendships I make with each dog and cat and getting to be outdoors everyday! 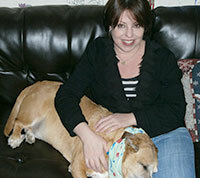 I look forward to meeting you and caring for your furry family members whenever you need me.